The Streets are turning into battlefields for the water splashing fight. 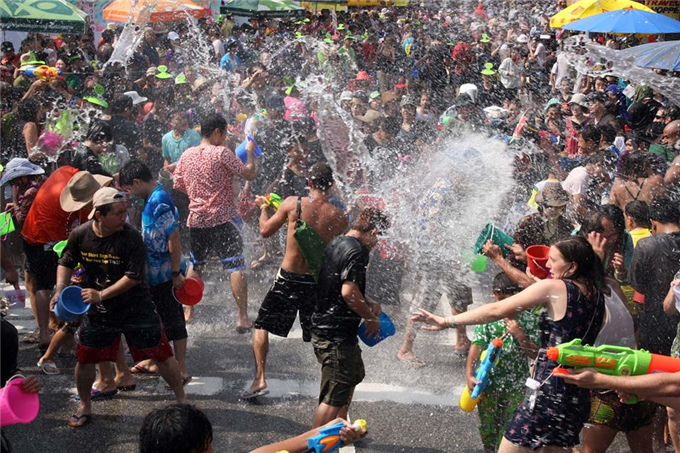 Thailand's much-loved Songkran celebration will be back this weekend and, as usual, the streets and sois will be transformed in open battlefields for the annual water splashing fight. Those seeking a quieter place to celebrate the beginning of the Thai New Year can check out the venues below, all of which are focusing on the traditions of yesteryear. For a splashing good time, there are no areas better than Silom Road and the backpacker paradise Khao San Road for a thorough soaking. A less-harried celebration can be found at Lhong 1919, a reclaimed street of old warehouses, that marks the occasion in a more traditional way. “Songkran at Lhong 1919” gets underway today and continues to Sunday. The newly renovated pier on the Thon Buri side of the Chao Phraya River features four-metre-tall sand pagodas in different designs reflecting the unity of Thais and the glorious days of the Sukhothai, Ayutthaya and Thonburi kingdoms painstakingly crafted by artist Tan Kositpipat. A “jasmine tunnel” graces the entrance and boasts holy water from the Dhevaphisek ceremony of Somdej Phra Wannarat for blessings, while Wat Phichaya Yatikaram Worawiharn’s highly revered Buddha statue called Phra Somprathana awaits the auspicious bathing ritual. There’s food too with a traditional khao chae to help cool down the tummy and music by Symphony Swing every evening. Traditions are also being honoured at Songkran Wisut Kasat beneath Rama VIII Bridge. 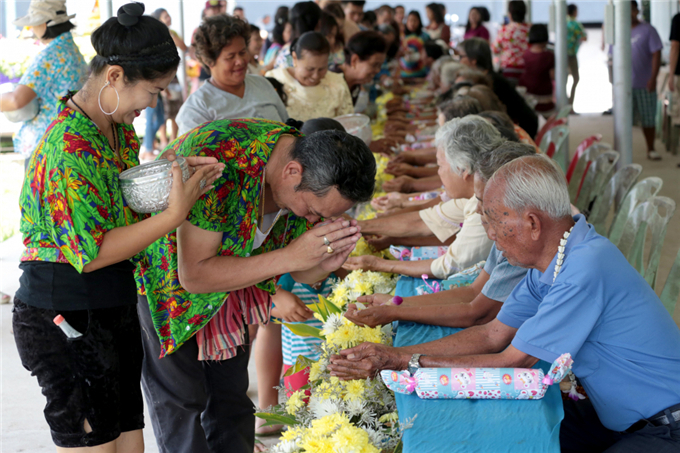 Tomorrow and Friday, bustling Wisut Kasat Road will play host to several religious ceremonies and cultural performances conducted by the Wisut Kasat community club. Residents will gather on the street early in the morning for the ritual almsgiving to monks, bathe sacred Buddha statues and take part in the rod nam dam hua ceremony, in which celebrants pour water over elders’ hands, and wash their mothers’ feet to ask for blessings. Visitors can also participate in the venerable Chak Phra tradition, which will see a float installed with Buddha images being pulled around the neighbourhood and towed to the river to pay homage to Lord Buddha. For a more modern take, check out the Miss Songkran pageant. The old Lanna capital in Thailand’s North underlines its traditional heritage with the Paweni Pi Mai Muang Chiang Mai Songkran Festival running from Friday to Sunday. On the morning of April 13, known as Wan Sangkhan Long in Lanna, villagers will light firecrackers to bid farewell to the last day of the year and send off bad luck and evil. 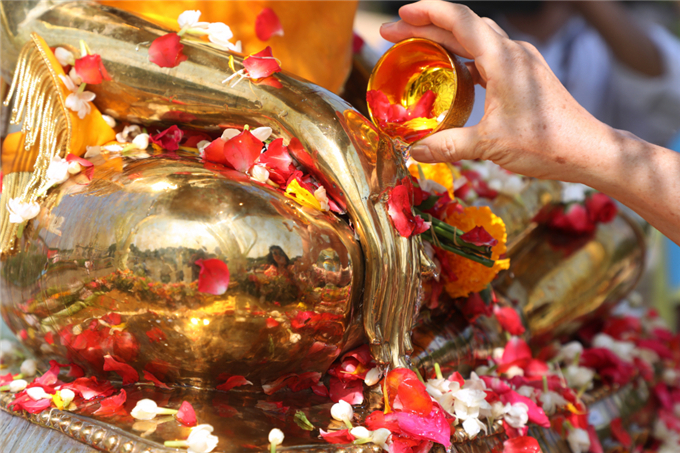 In the heart of the town running from the Three Kings Monument and Tha Phae to Wat Phra Singh, foreign and local tourists will get a chance to take part in a bathing rite of the revered Phra Buddha Sihing and a stunning procession to convey sand to the temple. 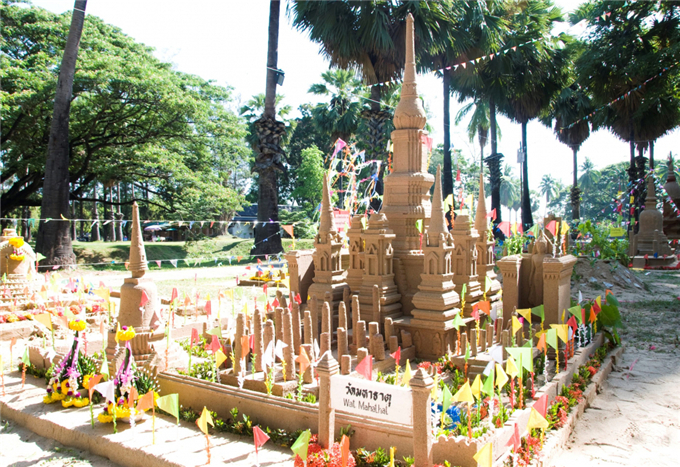 Locals will show off their skills in building towering sand pagodas in tribute to the Lord Buddha. During the day, specialists will conduct free demonstrations on how to make traditional festive desserts like khanom tien (pyramid-like stuffed dough), tom mad (sticky rice filled with bananas) and khanom pad (steamed layered cake made with rice flour and cane sugar). In the evening, the festival has retro Lanna-style dances and the Miss and Mr Songkran contests. On the bank of the Mekong River in Thailand’s northeast, Nakhon Phanom is all set up to serve as a cultural bridge with the hosting of the Delightful Thailand-Laos New Year Celebration this weekend at Lan Phanom Naga. Here, the daily rite of almsgiving is conducted in the same way as in Luang Prabang, with pilgrims gathering on the street and using their hands to scoop up sticky rice. Residents also head to the temple to build sand pagodas and join a bathing ritual of the Phra That Phanom stupa rather than Buddha statues. The event includes cultural performances and recreational activities from seven tribes, a market offering enticing local delicacies and handcrafted merchandise, a Miss Songkran procession and water fights on Khao Pun Street. Fans of the hit TV series “Buppesanivas” will no doubt be glad of another chance to don beautiful period costumes and celebrate the water festival in Siam’s old capital just as their ancestors did in the reign of King Narai. Throughout the weekend, Si Sanphet Road will serve as the main Songkran venue where tourists can join the bathing ritual of Buddha statues, sand pagoda building, retro Thai dance and water fights with elephants from Ayutthaya Elephant Palace & Royal Kraal. The Song Nam Oi Tan ceremony, which started on Sunday in Si Satchanalai district, continues until tomorrow at the Monument of Phra Maha Thammaracha I (Lithai). The event includes a procession to pay homage to Phra Maha Thammaracha I, King of the Sukhothai Kingdom between 1347 and 1368, a colourful food street, cultural performances and parades by 10 communities. 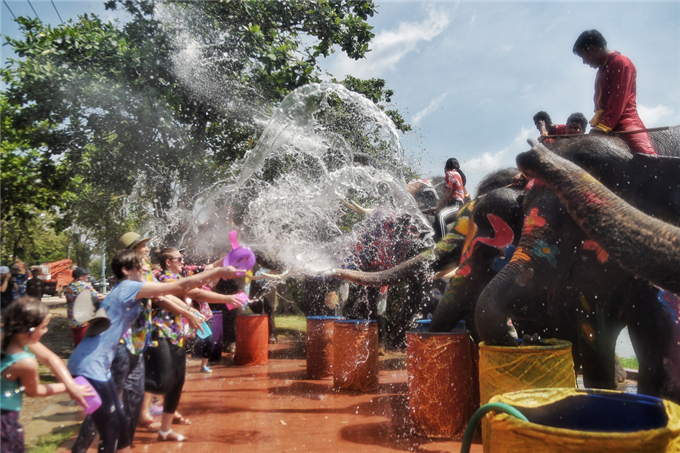 The Retro Songkran Splendours event at Sukhothai Historical Park gets underway tomorrow and runs until Saturday. Cultural activities and performances abound, among them a sand pagoda building competition, Songkran beauty contest, traditional sports and a market selling all kinds of local dishes, snacks and desserts. 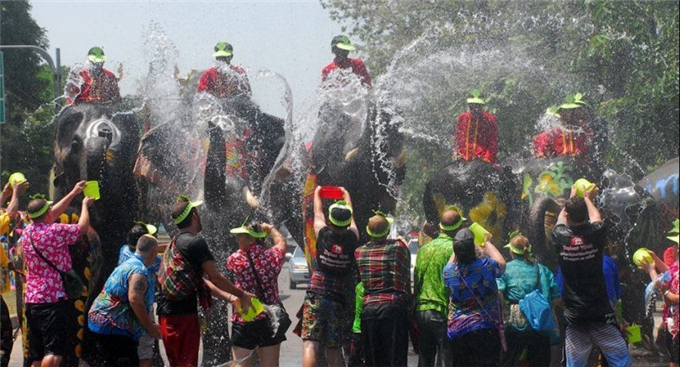 The city is also playing host to the Flowery Shirt Songkran on Khao Tok Road from tomorrow until Sunday. Visitors can have fun dressing in colourful flower-patterned shirts and joining the “flower car” procession with Miss Songkran, build sand pagodas at Wat Thai Chumpol and watch traditional Thai dance. Down south, meanwhile, the Songkhla Grand Songkran Celebration and Had Yai Midnight Songkran Festival run from tomorrow to Sunday around Nipat Uthit 3, Sanehanusorn and Thammanoon Vithi roads. Popular with tourists from Malaysia and Singapore, this year’s highlights include Songkran carnival parades, the bathing ritual of Buddha Sihing and Luang Poo Tuad, daily almsgiving, pouring water over elders’ hands, a Miss Songkran contest and an exciting muay talay or sea boxing competition. Less than two hours away from downtown Bangkok, Bang Saen Beach will host a sand pagoda building ceremony to celebrate Wan Lai (Songkran Day) a little later than the rest of Thailand. 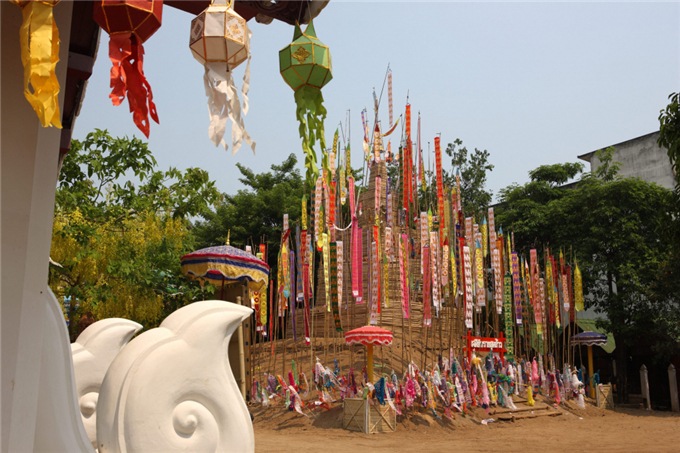 On Monday and Tuesday, locals will gather together on the beach for a sand Buddha image contest, take part in traditional sports, have a go at shucking oysters and feast on tempting culinary specialities at the OTOP fair.